Rank of Glenn Close's movies by Box Office performance. Q: Does Garp die at the end? 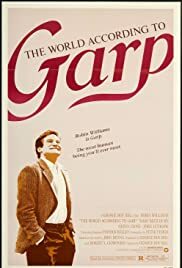 Q: Is The World According To Garp based on a book? this is the only movie of robin williams' that i can sit through. in every other movie (too many to count), robin drops character more than once and becomes mr. lovable comedian. not because the script calls for it, but because i think he gets uncomfortable with acting and finds it easier to go back to his roots. even "good will hunting," where he is his most restrained in years. it helps that George Roy Hill is an amazing director, and that the story is odd enough that robin doesn't have to invent something weird to keep him interesting. glenn close and john lithgow are amazing in their roles. and robin is touching and funny without going overboard. a nice, quirky American classic. and who doesn't love the Beatles "When I'm 64"?